JC1- Mitochondrial Membrane Potential Assay Kit ab113850 contains tetraethylbenzimidazolylcarbocyanine iodide (JC-1), a cationic dye that accumulates in energized mitochondria. At low concentrations (due to low mitochondrial membrane potential), JC-1 is predominantly a monomer that yields green fluorescence with emission of 530±15 nm. At high concentrations (due to high mitochondrial membrane potential), the dye aggregates yielding a red to orange colored emission (590±17.5 nm). Therefore a decrease in the aggregate fluorescent count is indicative of depolarization whereas an increase is indicative of hyperpolarization. The aggregate dye can be excited at 535 nm, the monomer and aggregate together at 475 nm. JC1 - Mitochondrial Membrane Potential Assay Kit (ab113850). HL60 cells were seeded and labeled according to section 11.1 of the protocol. 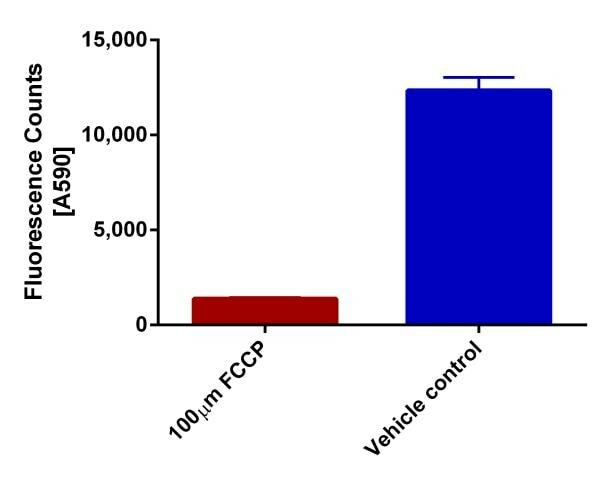 Cells were then treated for 4 hours with 100 µM FCCP or vehicle/diluent control (DMSO). Mean and standard deviation is plotted for 3 replicates from each condition. 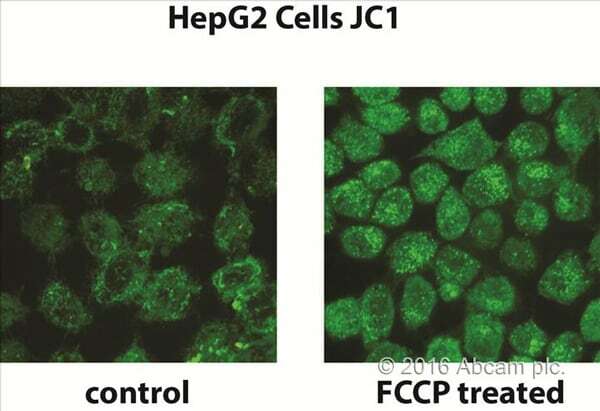 JC-1 assay result in HepG2 cells treated with CCCP. 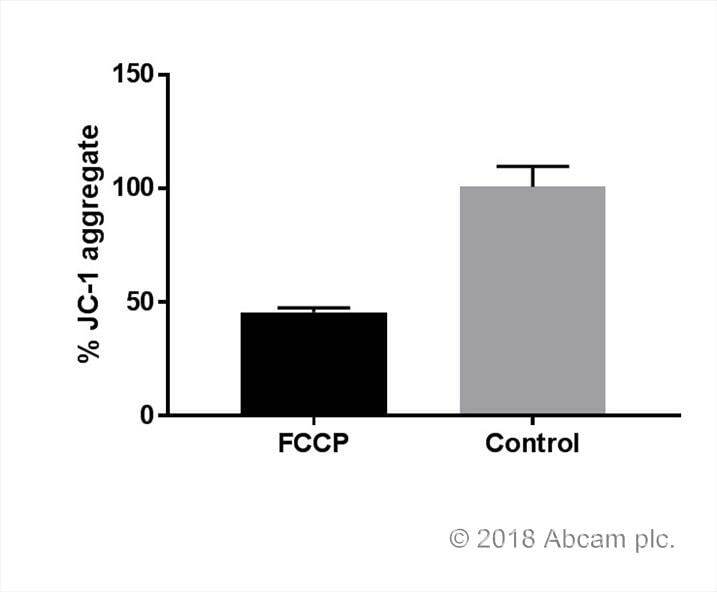 The JC1- Mitochondrial membrane potential assay kit has been tested using HepG2 cells, control cells and FCCP-treated cells (100uM for 4h) have been used as a positive control. The company's instructions were followed for JC1 mitochondrial membrane potential assay. Imaging was performed on a customized Andor Revolution Spinning Disk Confocal System built around a stand (IX81 Olympus) with a 60x lens and a digital camera (Andor Ixon+885) (CIBIT Facility, MBG-DUTH). Image acquisition was performed in Andor IQ 2 software. Optical sections were recorded every 0.3 µm. All confocal microscopy images presented in this work are 2D maximum intensity projections of z-stack images (ImageJ 1.47v National Institute of Health,USA). 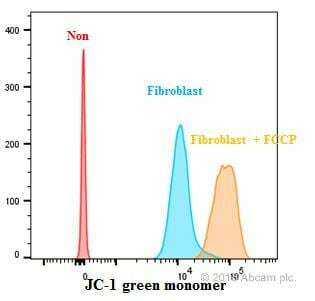 Personal feedback: A green laser with the appropriate emission filter (530nm) has been used to detect the monomer of the JC1 dye, following FCCP treatment the mitochondrial membrane potential of the cells was eliminated, as demonstrated by the increase of the monomer emission. mitochondrial membrane potential in human fibroblast cells was determined by JC-1. FCCP treated cells showed increased monomeric (green) signal which supported change of mitochondrial membrane potential compared to control cells. We used JC-1 on primary mouse astrocyte culture to rate the mitochondrial stress under different inflammatory stimuli. Following the protocol recommended, we fount this kit an useful and easy to use tool.